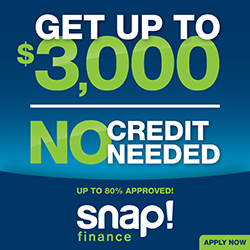 Discover an affordable way to finance tires and wheels with SNAP! Finance. There's no credit needed and an online application is available, making it easier to secure financing for the automotive products you need on a budget. Get what you need today and make small payments over time. At Mad Maxx Total Performance, our goal is to make shopping convenient for our customers in Tampa, FL, St. Petersburg, FL, Clearwater, FL, and surrounding areas. Approval is fast. In short time, you'll know what you're approved for and be able to take your purchase out the door. Come into Mad Maxx Total Performance today, or apply online now.